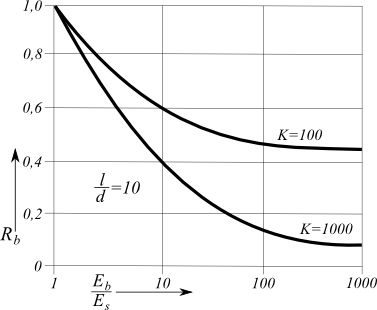 The values of the correction factor Rb are generally presented as a function of the ratio of modulus of elasticity of pile and secant modulus of soil at the pile base and the surrounding soil (Eb /Es) for various pile-stiffness factor K and various pile length to pile diameter ratios (l/d). These graphs are implemented in the program in a digital format. Poulos, H. G. et. Davis, E. H.: Pile Foundations Analysis and Design. New York: John Wiley and Sons, 1980, chapter 5.3.3, pp. 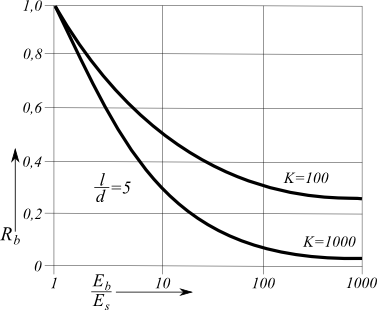 90 (figure 5.22).